One Hundred and Nine degrees. I know the weather chick said it was “only” 107… but she also told me that we “only” had a 30% chance of rain in late May. Buy my thermometer said 109. So 109 it is. How do you deal with 109 degrees? I weed the garden with the sprinkler running and then I make margaritas. And then I hit up the pool. I snagged some red and black plums last week on sale and whipped them up into a couple of batches of margaritas. They both yield the same fruity concoction taste-wise, but black plums (above) make a much darker (and therefore harder to photograph) drink than red plums (top). And either will work just fine to help you almost forget that your back yard feels like a convection oven. And will for another 3 months. 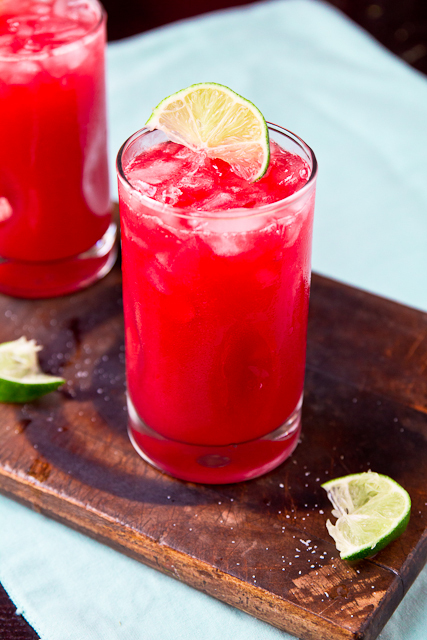 Fresh red or black plums are cooked into a beautiful red syrup and then blended into the perfect summer margarita. Place the plum slices (skin still on) in a small sauce pan with water and sugar, if using. (If using a sugar substitute, add at the end to taste). Bring to a boil and simmer covered for 5-7 minutes, until the fruit is very soft and the liquid has taken on the color from the plums. Let cool a few minutes and then transfer to a blender with the lime juice, orange juice/liqueur, and tequila. Blend for ~30 seconds, until completely smooth. Pour over ice into salt-rimmed glasses and serve with lime wedges. These margaritas look like a refreshing way to cool down. While the heat here hasn’t been too bad, the humidity has been awful. Ugh! We are right there with you on the heat. The forecast is “only” in the upper 90’s right now and it’s so cool by comparison to a few days ago that I want to wear jeans! Back to the 100+ any day now. I will be stocking up on the ingredients for this before the temps head back up for sure! Gah I can’t even imagine!! I’d need quite a few of these babies to get me through. So glad you posted this recipe! I have a ton of plums from our CSA box and was hoping I could work them into a cocktail for this Thursday. Margaritas have always been my favorite drink to kick back with on the beach for the 4th of July. Thank you! Oh the heat!! We actually got a reprieve this week…only 80’s in Arkansas!! Not that that helps YOUR situation any. Okay, I’ll stop talking now. 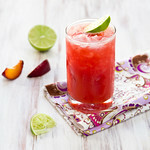 Plum margaritas? Too good to be true. 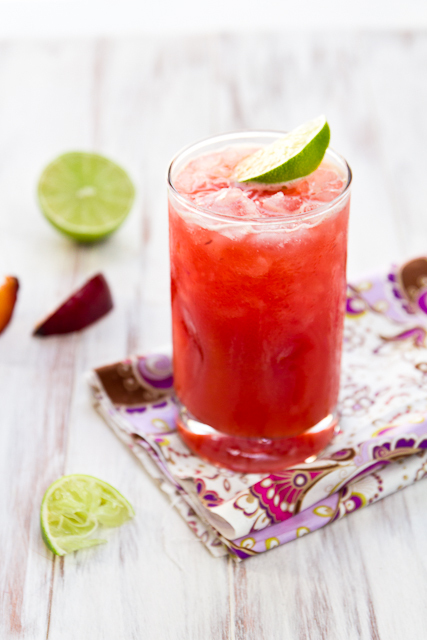 Just saw a recipe for plum margaritas on Monday and thought, hmmm – here’s one I haven’t seen in a margarita yet. And then, this. I still have a few of those good plums I bought last week left – happening! Oh, good lordy these are gorgeous. I could put back a few over this lazy, long 4th weekend! After work this would be PERFECT! Looks awesome! The color that was extracted from the plums is just gorgeous!!! YUM! When the heat index rises, I cope by hiding inside during the daylight hours, and going out in the evening. Having a pool also helps. This is the second recipe in my feed that uses plums and has a gorgeous shade of red! Gosh, this one delicious looking glass of red goodness! Love it.